After previously purchasing two Fujitsu 'Scansnap' scanners and the A4-equivalent of the Fujitsu Fi-5530C2 a couple of years ago (all of which have worked perfectly and score 5 out of 5) I have been slightly disappointed with the A3 version. It took a (helpful) remote session with a Tradescanners tech rep to get the software to work. I have also found feeding A3 paper a bit hit and miss unless the sheets are in perfect condition. All in all, considering the big price differential with the A4 versions, only 4 out of 5 for this model. for a small footprint desktop device this is quick, quiet and reliable. very good peper handling, hardly ever double feeds. the free acrobat 8 std software is great (you can upgrade to 9 Pro for about $150 on the Adobe US site). 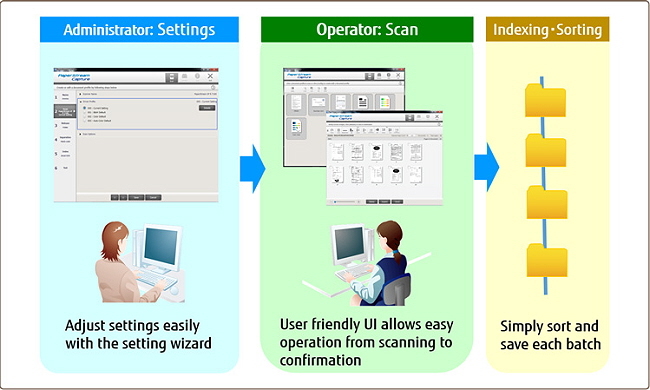 the scanning interface is much improved in 9 Pro and it has Redaction and the OCR is much faster. Exceeded my expectations in terms of speed, OCR pdf abilities and quality of image. The fi-5530C2 is a workgroup A3 capable scanner equipped with a 100 sheet capacity ADF that has a foldaway output tray, thereby keeping the footprint size to a minimum. The ADF is ideal for un-attended scanning of multipage documents and batches and can scan any paper size from A8 to A3. 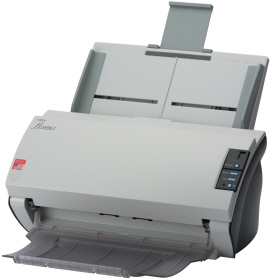 The fi-5530C2 offers high speed scanning at 35ppm simplex and 70ppm duplex (200dpi) in both colour and mono. The duplex facility allows the contents of both sides of a documents to be captured in one pass. High speed colour images at up to 600 dpi can be scanned using the built in JPEG compression. Bundled with the scanner is Adobe Acrobat 8.0 allowing users to easily convert documents to PDF files, the de-facto standard for electronic distribution.